Bhalissa ghaddejja l-Wirja Kollettiva ta' Mudelli u Minjaturi fir-Razzett tal-Markiz Mallia Tabone, fil-Mosta. Din hija wirja mtella' minn numru ta' membri tal-Ghaqda Filantropika Talent Mosti, fosthom l-organizzatur, David Zammit. Il-wirja fethet fis-16 ta' Jannar u se tibqa' miftuha sas-Sibt li gej, 30 ta' Jannar. Il-hinijiet tal-ftuh huma bejn il-5.30 u t-8.30pm. Id-dhul huwa b'xejn imma jigu accettati donazzjonijiet ghal ghan filantropiku. Fir-ritratt tax-xellug jidhru Joseph Vella (xellug), David Zammit (centru) u Anthony Zammit (lemin). Il-mudell tar-rigg taz-zejt mahdum minn Joseph Vella. Hawn jidhru l-mudelli tad-dghajjes u tal-vapuri u ajruplani tal-gwerra. Taht jidher l-Arlogg tal-Lira mahdum minn Anthony Zammit. Wiehed jara wkoll mudelli ta' trakkijiet u karozzi. Lemin: Id-dghajjes mahdumin minn Saviour Vella. Il-mudelli tat-tankijiet tal-gwerra u mudell ta' knisja. 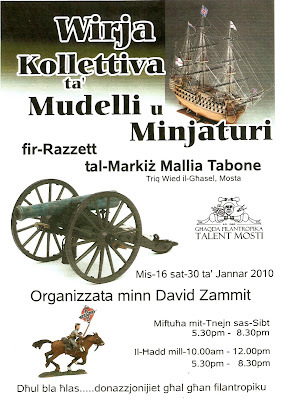 A collective exhibition of models and miniatures is being held at the Razzett tal-Markiż Mallia Tabone, in Mosta, Malta. Visitors at this National Cultural Centre can see a number of exhibits patiently built by members of the Mosta Philanthropic and Talent Organization. Among the exhibits are Second World War warplanes, tanks and warships, a miniature land oil rig built by Joseph Vella who in the 1960s worked as a rig engineer in the desert of Libya, Maltese traditional boats built by Saviour Vella, model trucks and cars, handmade miniature furniture, and a Maltese Pound (Tal-Lira) Clock made by Anthony Zammit. 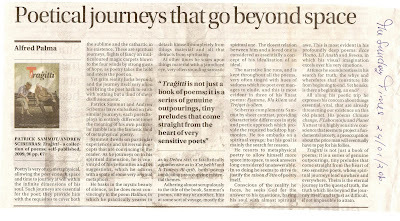 The exhibition - organized by David Zammit - opened last January 16th and is staying till next Saturday, 30th January. Opening hours, 5.30 – 8.30p.m. Entrance is free but donations for a philanthropic cause are welcome.